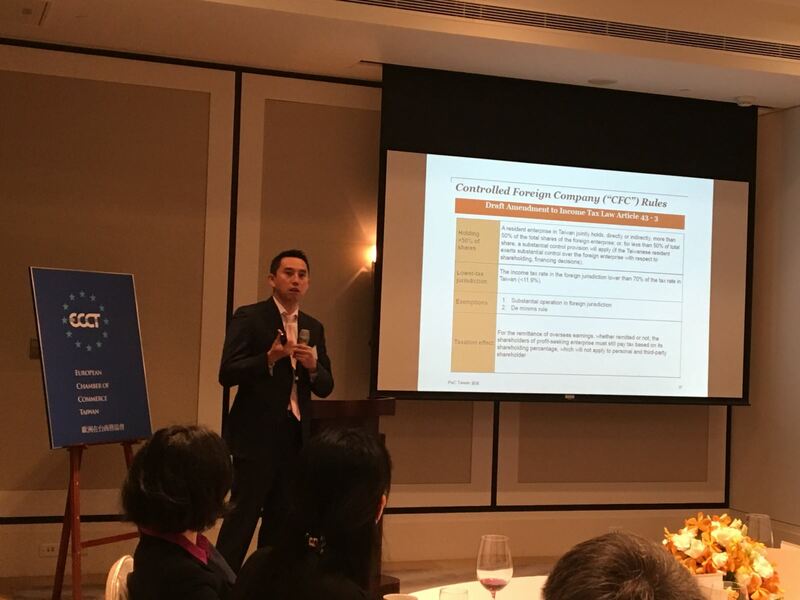 The ECCT's Tax committee hosted a lunch with speaker Peter Su, Director of International Tax Services at PWC in Taiwan. The speaker provided insights from PwC's Annual Global CEO Survey, now in its nineteenth year, and highlighted some international tax trends. This year's survey is based on responses from 1,322 CEOs in 77 countries, including 19 CEOs based in Taiwan, and surveys of 102 listed companies in Taiwan. The survey revealed that CEOs globally have become gradually less optimistic on the economic outlook over the past three years. CEOs in Taiwan are even more pessimistic than their global counterparts. Customers and clients are the top priority for CEOs globally, followed by government and regulations and competitors. The survey revealed that CEOs globally view the United States (US) as the offering the best investment opportunities, followed by China and Germany in third position. Taiwanese CEOs still believe China offers the best investment opportunities, followed by the US and Japan (although Japan's high ranking may be exaggerated by the impact of Hon Hai's recent takeover of Sharp). Germany ranked fourth, followed by Vietnam, Hong Kong, India and Thailand. The survey showed that CEOs are getting more concerned about a wide range of risks. Foremost among them is over-regulation followed by geopolitical uncertainty and exchange rate volatility. Priority concerns vary depending on the region. The top concern in the Middle East is geopolitical uncertainty while North Americans are most worried about increasing tax burdens and their Western European counterparts are most anxious about over-regulation. In the Asia Pacific, the top concerns of CEOs are exchange rate volatility and the availability (or lack thereof) of key skills. In terms of tax risks, CEOs in Taiwan regard reducing tax management and tax rates as equally important and believe that a stable tax regime is more important than a low tax rate. On the subject of the leaking of over 11 million confidential documents produced by Panamanian law firm Mossack Fonseca (the so-called Panama Papers), Su pointed out that there is now an Offshore Leaks Database listing 320,000 offshore companies and trusts implicated from more than 40 countries. Tax authorities are likely to start using this database to investigate companies and individuals they suspect of avoiding tax. The drive to increase overall tax revenues is the main motivation behind the collective action in the OECD to set global rules and procedures, especially the Base Erosion and Profit Shifting (BEPS) project. Taiwan authorities have also proposed new rules on Place of Effective Management (PEM) and Controlled Foreign Company (CFC) in order to try and identify additional sources of revenue. However, a reading of the draft rules appears to reveal loopholes, which would have to be plugged in the final version if the rules are to be effective.